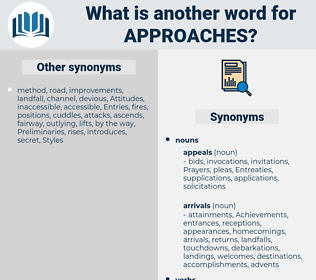 What is another word for approaches? formulations, patterns, schemes, FORMATS, Regulations, Standards, Capacities, devices, grounds, Vehicles, enfoques, assets, trails, Activities, controls, Measures, Measurements, Tracks, instruments, tools, Capabilities, mesures, Resources, rules, Facilities, avenues, looms, safeguards. Paths, measure, Measures, representation, programme, apply, channels, scope, communautaire, estrategias, moderate, measurement, Measurements, prospect, PROSPECTS, track, Tracks, instruments, tools, capability, Capabilities, strategize, outcome, community-based, content, mesures, capacity, Resources, fairway, rules, community, Them, Facilities, inputs, tract, commerce, features, looking, The, avenues, e., post, trading, waterways, highway, lane, standing, eligibility, medio, Medium-sized, streams, average, AGDM, trade, media, medium, looms, endnotes, food, safeguards, Les, motion, mean, strategy, strategies, perspective, perspectives. approa-ches, instructions, principles, tactics, communications, approches, factors, cooperation, reaches, Recommendations, considerations, relationships, operations, others, characteristics, charts, courses, stances, traditions, precautions, matters, presentations, combinations, Philosophies, applications, counter-measures, formulations, Records, practises, perspectivas, proceedings, Contraceptives, appropriations, circumstances, Theories, countermeasures, representations, transactions, coherence, treatment, treatments, purposes, standpoints, Prescriptions, preconceptions, patterns, viewpoints, crops, Consultations, structures, counterparts, platforms, touches, positions, scenarios, doctrines, schemes, responses, framework, frameworks, proposals, interactions, traditional, endeavours, performances, contributions, propositions, interventions, directives, understandings, organisations, inspirations, locations, mechanics, misconceptions, disciplines, crossroads, Efforts, reconciles, constraints, paradigms, reports, innovative, Recipes, convergence, implications, formalities, fashions, systems, respects, prevention, therapies, Physicians, processing, accessions, specifications, speeches, Focuses, Schemas, notions, worldviews, Adopting, FORMATS, minds, programmes, politicians, preparations, calculations, cancellations, observations, assumptions, outskirts, adopted, examples, contaminants, marches, precedents, Suggestions, technologies, crossings, Telecommunications, Phenomena, Negotiations, consistency, Programs, phrases, contacts, nominations, plans, vision, Visions, Styles, Instrumentalities, e-strategies, Ideas, innovations, shapes, manners, moves, topics, spheres, coastlines, potentials, entrances, experiences, appeals, shortfalls, machineries, Categories, views, shores, protocols, jurisdictions, things, Addresses, follow, words, norms, thanks, headings, thoughts, Possibilities, concerns, estimations, pillars, constructions, handle, supports, Consultants, narratives, stairs, roadsides, Phases, politics, handling, opinions, points, components, aspects, outcomes, benchmarks, reasons, remarks, Habits, offers, aims, corridors, consists, focusing, corners, qualifications, Regulations, deductions, optics, decisions, definitions, parameters, doors, Standards, dimensions, regimes, parts, reservations, customs, projects, roads, dealings, variations, shorelines, Intentions, Evaluations, Capacities, themes, devices, environment, Environments, targets, issues, development, developments, statements, Tendencies, chances, priorities, Roles, accesses, acts, postulates, requirements, expressions, document, rows, facts, grounds, Replies, comments, moyens, Vehicles, Cultures, arguments, Gestures, institutions, exchanges, situations, shares, services, yardsticks, hands, PBAS, constructs, aggregations, sharing, elements, resolutions, starts, packages, livelihoods, arms, face, Schools, hits, finances, banks, metrics, model, models, FAIRWAYS, enterprises, FACETS, managers, attempts, mannerisms, equations, sections, petitions, coasts, shows, pleas, marks, ideals, domains, developing, enablers, overtures, Races, skills, Exercises, changes, cultural, notices, Goals, surroundings, settlements, Forums, Beliefs, thrusts, stocks, wordings, Abilities, Incentives, weapons, sources, uses, tricks, kinds, results, fields, develop, versions, clauses, Syllabuses, walking, affairs, submissions, looks, voies, insights, tenets, differences, Areas, levers, speakers, variants, Communities, assets, answers, assessments, strands, Templates, fronts, bidders, works, zooms, agendas, strips, frames, Keys, range, places, passages, posts, planned, Foundations, samples, calls, problems, assays, Lifestyles, Schedules, Interviews, shafts, healthy, Registries, markers, clues, deficits, Salaries, Freedoms, runways, gaps, advances, highways, aids, tasks, settings, pistes, registers, trails, types, margins, Axes, bids, Grips, discusses, materials, networks, LANES, Judgments, wages, Families, Parties, paragraphs, powers, Activities, averages, sides, estimates, edges, questions, subjects, Mediums, leads, Incomes, Classes, airlines, rulings, dots, Inquiries, executives, links, airways, claims, Ones, revenues, Undertakings, alarms, outlets, deeds, hubs, disputes, controls, modules, beginnings, streets, Tests, venues, flags, offices, Envisaged, enquiries, Studies, stages, needs, axles, supplies, Surveys, burdens, funds, requests, fixes, women, amounts, spindles, items, signs, spells, states, Measures, Motions, demands, runs, guys, Lives, events, Bases, Universities, news, programme, channels, estrategias, Measurements, PROSPECTS, PATHWAYS, Tracks, instruments, tools, Capabilities, feelings, mesures, Resources, rules, community, Facilities, inputs, features, waterways, streams, media, looms, safeguards, strategies, perspectives. broaches, policy, principles, appears, contemplates, approximates, adopts, applies, regarding, regards, considers, reaches, explores, address, Addressing, follows, treats, tackles, handles, almost, covers, contains, observes, recognizes, matters, presents, enters, proposes, perspectivas, Comes, arrives, Of, project, closes, communicate, communicates, solicits, notes, includes, proposals, walks, area, seeks, speaks, Faces, solutions, technical, continues, poses, outlines, conveys, des, reconciles, arises, refers, happens, examines, invites, engineering, review, reviews, resembles, welcomes, Focuses, tends, agenda, technologies, contacts, nominations, plans, highlights, establishes, head, heads, machineries, views, intends, finds, raises, analyzes, Addresses, sets, Analyses, concerns, introduces, emerges, draws, envisages, benchmarks, believes, aims, optics, regimes, projects, S, Capacities, takes, brings, acts, moyens, unfolds, goes, models, see, sees, shows, puts, K, Does, uses, looks, Templates, works, places, advances, meets, discusses, leads, gets, Studies, stages, needs, amounts, Measures, runs, channels, estrategias, measurement, Measurements, PROSPECTS, PATHWAYS, Tracks, mesures, rules, waterways, looms, Les, strategy, strategies, perspective, perspectives. 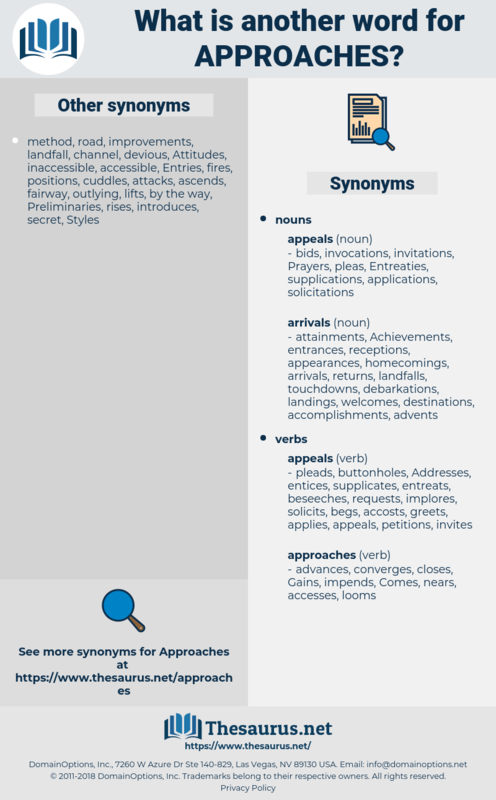 interpretations, approximations, conceptions, Perceptions, Attitudes, solutions, demarches, reflections, premises, Formulas, Formulae, Angles, judgements, method, methods. political, angle, deals, Formulas, method, methods. The time approaches when we are to feed ourselves, so the instinct arises to carry everything to the mouth. There is a tremor of horror in anticipation, and then the animal stands perfectly quiet, though ordinarily he would be quite able to escape, while its enemy approaches.